The Walt Disney World Resort has many great dining locations. After much research Only WDWorld is choosing the Top 10 Quick Service Dining Restaurants at Disney World for 2010. With over 40 different Quick Service Dining Locations located in the 4 main theme parks and Downtown Disney, it wasn't easy to pick a Top 10. Menu - Variety and uniqueness for a Quick Service Location. Entrees - The quality of the top Entrees that this location serves. Desserts - Desserts are an important part of a Quick Service meal when you are using one of the Disney Dining Plans. Surroundings - This looks at the theming, seating areas, entertainment, and extras like topping bars. Dining Plan Value - This looks at the value received when using a Disney Dining Plan Quick Service Credit instead of paying cash to each there. The evaluation was also limited to just the 4 main Disney World theme parks (Magic Kingdom, Epcot, Hollywood Studios, & Animal Kingdom) and Downtown Disney based Quick Service Restaurants. Each restaurant can earn up to 5 points(higher is better) in each category for a maximum of 25 points. 10. 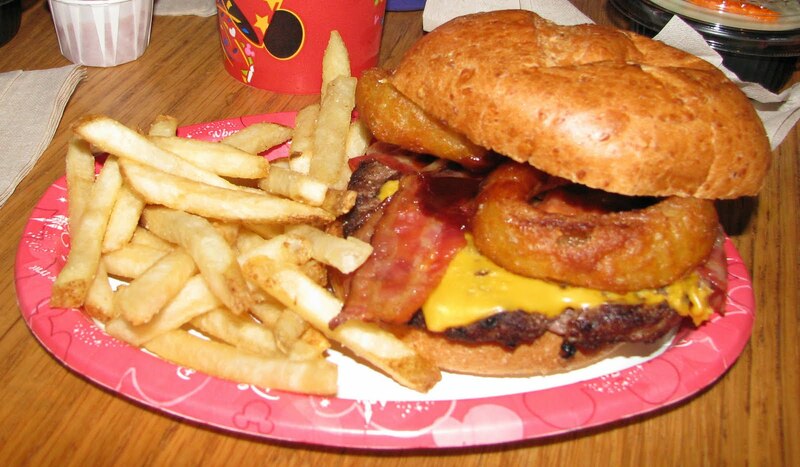 Pecos Bill Tall Tale Inn and Cafe - This Magic Kingdom staple is home of the best burger found at a Disney World Quick Service Restaurant. The toppings bar with grilled mushrooms and onions and the great theming help earn Pecos Bill's a place in our Top 10. 9. Fairfax Fare - Hollywood Studios now has a place where you can get Beef Brisket and Barbecue Ribs. The new menu at this Quick Service location in the shadow of the Twilight Zone Tower Of Terror brought it to our attention and helped it earn a place on this year's Top 10. 8. Cosmic Ray's Starlight Cafe - Cosmic Ray's is a favorite for many families visiting the Magic Kingdom. The 3 different food service bays in one location helps families all find something they like. Add the large seating area and entertainment from the audio-animatronic alien - Sonny Eclipse and you have another nice Disney World extra. Surroundings 3 Entertainment from Sonny Eclipse. 7. Yak & Yeti Counter Service - This counter service version of the Table service Yak & Yeti restaurant provides an Asian inspired menu that deviates from your typical theme park food. The setting is pasrt of the well themed Asia section of the Animal Kingdom. 6. Starring Rolls Cafe - This Bakery made it into our Top 10 on the strength of its awesome sandwiches and the best desserts that you will find in a Quick Service Location at Disney World. How can you top the Butterfinger Cupcake? Maybe with a Praline Cheesecake,Tiramisu, or a Napoleon. Dessert 5 Home of Butterfinger Cupcake! 5. Flame Tree Barbecue - Great Animal Kingdom eatery. The Ribs are tasty and the portions are huge. The seating area is incredibly well themed and much larger than most people realized. Must visit restaurant during each Animal Kingdom trip. New addition of Chocolate Mousse & Key Lime Mousse to desserts elevates status in 2010. Dessert 3 New Chocolate Mousse is great! 4. Sunshine Seasons - Judging by the crowds this place is certainly no secret. Great Varied menu with items from Sandwiches to Asian cuisine to rotisserie pork chops and grilled salmon. Awesome dessert choices including real cheesecakes. Main drawback is crowded seating area. 3. Cooke's Of Dublin - This Irish eatery hidden on the back of Raglan Road in Downtwon Disney serves up some incredible Fish and Chips and other Irish Cuisine. The homemade Dublin Style Pies like Beef & Labp or Chicken & Mushroom are great. The deep fried candy bar called the Doh-Bar pushes this restaurant to the top of the list. Everything is made to order which makes the food very fresh and hot. Entree 5 Great fish and Irish Pies! Dessert 4 Got to try the Doh-Bar. 2. Tangierine Cafe - The Moroccan Cuisine at Tangierine Cafe is definitely the best of all of the Epcot World Showcase Quick Service and almost the best in all of Disney World. The Shawarma Platters are excellent as are the other entrees. The Baklava is very tasty for dessert. The theming is very nice and you can see the performances of the great Mo 'Rockin while you eat. Entree 5 Lamb Shawarma Platter is awesome! 1. Wolfgang Puck Express - Tops on the list for 2010 is the Wolfgang Puck Express in the Marketplace section of Downtown Disney. The menu is varied from Salads to Sandwiches To Gourmet Pizzas To Salmon. The service is great and this is as close as you will get to a Table Service restaurant with your Disney Dining Plan Quick Service Credit. The Creme Brulee is a great way to top off your meal. Entree 5 Food is excellent! No bad choices. Did Your Favorite Restaurant Win? Food is one of the best parts of a Disney World vacation and many people feel strongly about their favorites. How did this list compare to your personal favorites? Did your favorite even make the list? Post a comment to let us know what you think. 6 comments to "Top 10 Disney World Dining Plan Quick Service Restaurants"
Thank you so much for posting these absolutely awesome Top 10's. So far, I have read the Top 10 Quick Services and the Top 10 Table Services. They both have invaluable information! My family is now planning our first WDW vacation for September 2011 and I've been working on figuring out where we plan to eat. Your site rocks! Great list, I would only add the quick service restaurant at Coronado Springs. You can get a full steak dinner for a counter credit. Great list. Thanks so much for the info. Earl of Sandwich should be added along with the Pepper Market at Corondo. There is a reason you will wait in line for a half an hour for a sandwich!